Private well maintained 4 Bedroom/3.5 bath Oceanside Waterfront Home with 180 foot dock surrounding property. Enjoy our 14' x 20' Tiki Hut overlooking 2 canals, mature tropical landscaping, and nature with a 42'' Flat Screen TV, Cable, Stereo/CD player, IPOD Docking, WIFI, 2 ceiling fans and 2 outdoor mounted hi power fans. The ultimate family and couples vacation home. Spacious, comfortable furnishings with leather living room furniture, quality towels, and bedding. Completely tiled interior. Quiet location overlooking 2 deep water canals that lead to North Sound Creek/Atlantic Ocean and Largo Sound, South Sound Creek/Atlantic Ocean, Adams Waterway (The Cut), and Blackwater Sound/Florida Bay. Fish, swim, paddleboard, kayak, and canoe from the 180' concrete dock surrounding the property. 12,000 pound boat lift. 2 Master Bedrooms with queen size beds overlooking the canals and nature, 1 bedroom with queen size bed and bathroom/shower and one bedroom with full/double size bed. Mature heavily landscaped yard with Areca Palms, colorful bouganvillas, hibiscus, crotons, silver buttonwoods, snow on the mountains. Completely fenced with 6' wood and 6' bamboo privacy fencing. Enjoy our private outdoor enclosed oversized roofless shower/bathroom. We are just 1.5 miles from entrance to John Pennenkamp State Park with 2 beaches and the best fishing and diving in the country. Very relaxing, scenic, and peaceful. 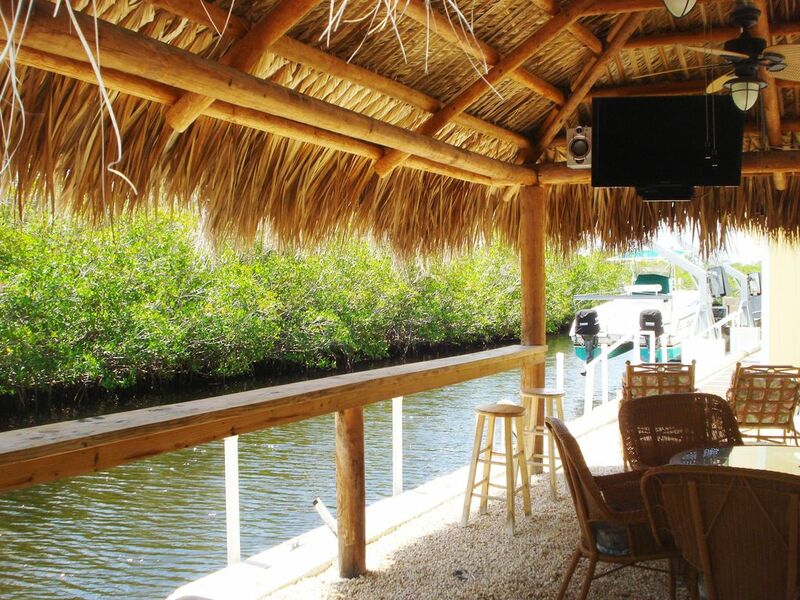 Fish, swim, sun, grill on the 2 grills, and enjoy the manatees and nature under the Tiki Hut. Launch from the dock (3) 16' Canoes, (2) 14' Kayaks, (1) 13' Kayak(all gear included) and 11' paddleboard. Paddle to North Sound Creek/Atlantic Ocean, Largo Sound Bay, and South Sound Creek to the Atlantic Ocean or float through Adams Waterway (The Cut) into Blackwater Sound/Florida Bay and beautiful sunsets. Cruise the newly paved 10+ mile bike path through Key Largo on 6 adult male and female bicycles (2 Multispeed and 4 Keys Cruisers) and 4 children's bicycles. (2 boys&2 girls) We offer our boat for rent, Grady White, Family Tournament Model, 150hp Yamaha 4 stroke motor, Bimini Top, GPS/Fish Finder, 5-6 fishing poles and all coast guard equipment. Included with boat rental is our personal guided 2 hour demo/orientation cruise of Key Largo waterways and the Atlantic Ocean. Snorkeling gear, nets, 4 coolers, bait buckets, and 6 fishing poles are provided. Please call owner (Jim), 561-716-0720, anytime, for information. Thank You and have a great day! I grew up in Michigan and joined the US Air Force when I was 18. I was very blessed with great tours, life long friends, and wonderful experiences. Retired from the Air Force with over 20 years service. My family has lived in Key Largo for over 40 years. My hobby and passion is making our property very special for our guests. Come enjoy! Nature and privacy at its best. Awesome place to relax and make memories with your family. The Florida Keys have the least amount of yearly rainfall in Florida. We take pride providing an wonderful environment for your family to have great fun, family experiences, and to create life long memories. Privacy! Privacy! Peace and tranquility. Fish and feed the tarpon, mangrove snapper, parrot fish, look downs, grunts, trigger fish, pinfish from the Tiki Hut. Property is surrounded by 180' concrete dock on 2 canals with beautiful nature across canal from Tiki Hut. Swim, kayak, canoe, paddleboard, and boat from our dock. Sit under the Tiki Hut and enjoy breakfast, lunch, dinner and your favorite beverage. Grill out on the large stainless steel gas grill and/or the weber charcoal grill. Home has 2 ocean accesses via North Sound Creek and Largo Sound Bay through South Sound Creek. 5-10 minutes to Largo Sound via power boat. Located on 2 oceanside canals on large corner waterfront lot. Canals leads to the Bay and the Ocean. 180' concrete dock surrounds property with mature tropical landscaping. Centrally air conditioned throughout home and additional wall unit in lower master bedroom. New linens, pillows, towels, and beach towels are provided. New extra large oversized washing machine. New extra large oversized clothes dryer. Parking for vehicles and boat trailers inside fenced yard of property. 10 x 16 shed. Washer, dryer, chest freezer for fish, bait and ice. 10 bicycles (adults and children), water floats/toys, kayak/canoe paddles, life vests/life preservers, 4 coolers, 4 beach chairs. Comfortable leather furniture. 40' flat screen with DVD/VCR combo. Many DVD's, VCR tapes, adult and children's reading books and games, cards and dominoes. Full size refrigerator with ice maker and bottom freezer. Flat Top Stove with oven with plenty of cooking/baking corning ware, pots, pans, skillets, and cookie sheets. Large microwave with all cooking pans. Regular Coffee Maker and Keurig coffee maker. Toaster Oven and regular toaster is provided. Coffee and filters, salt, pepper, cooking oil, several differerent cooking spices, salad colanders, cutting boards, knives, beer mugs, coozies, wine glasses. 2 sets of dishes, silverware for 12 people, plenty of cookware, utensils, glass food storage containers, glass food preparation bowls and dishes. Electric can opener, Electric coffee bean grinder. TV's and DVD players in each bedroom, and living room. 42" flat screen TV and stereo under Tiki Hut. (6) Flat Screen TV's/DVD players in living room, 4 bedrooms, and Tiki Hut. All are connected to cable. Stereo located under Tiki. CD and IPOD docking. DVD players in each bedroom and Living Room. dominoes, cards, childrens games, books, footballs, soccer balls, basketballs, beach toys, water toys, floats, and more. Water toys, balls, nets, and floats in shed. We provide both automatic and manual air pumps for air mattresses, bicycles, and water floats and toys. Tiki Hut is directly accessed from both master bedrooms. 2 Kayaks (singles) 14' length, 1 Kayak (tandem) 13' length and 3 canoes, 16' length, and 11' Paddleboard are provided for guests use. All paddles and life vests provided. 10 bicycles (Adults and Children) and automatic and manual air pumps. We offer our boat for rent. Grady White, 150hp Yamaha/4 stroke, Bimini Top/GPS/Fishfinder/4 fishing poles/ coast guard equipment. 2 hour demonstration cruise of Key Largo waters and Ocean included. Tiki Hut overlooking 2 canals on corner waterfront lot. 180' concrete dock surrounds tropically landscaped property with palm trees and many tropical plants and hedges. Very private and peaceful. Water toys/floats/4-6 fishing poles/tackle box/snorkels/masks/fins, nets, bait buckets, Live well bucket, 4 coolers, 4 beach chairs provided for our guests use. Local Key Largo Community Park located at MM100 (Oceanside). 'Jacobs Aquatic Center' has 4 swimming pools, diving boards and Pirate Ship pool, 1 foot deep. Please google for additional details. Provided for you are 3 Canoes, 16' long, 2 Kayaks, sit on top models, 14' long, 1 Kayak (double seater) sit on top, 13' long, Paddleboard 11' long, 10 bicycles, and water toys for swimming in the canal. We offer our boat for rent, Grady White, Family Tournament Model, 150hp Yamaha 4 stroke motor, Bimini Top, GPS/Fishfinder, 5-6 fishing poles and all coast guard equipment. Included with boat rental is our personal guided 2 hour demo/orientation cruise of Key Largo waterways and the Atlantic Ocean. Call owner (Jim) for boat pricing and details at 561-716-0720. Our private community boat ramp for launching boats and jet skis free of charge. Large roofless enclosed, attached to the home, private, outdoor tiled bathroom/shower. (See the wonderful stars every night). This property is beautiful and very relaxing and stress free. Jim is great and very accommodating. We got visits from the iguanas and manatees. The only reason why it did not get 5 stars is you can't really fish in the canal, everyone feeds the fish so they won't bite. That is really the only downside. Awesome place, tons of wildlife and very private. Would definitely come back. What a wonderful gem on Key Largo! The house and gardens are beautiful, well cared for and extremely comfortable. The house was impeccably clean and beautifully decorated. The whole group enjoyed spending time at the tiki hut watching my son and husband fish. They fished every day and were very successful. We appreciated having the kayaks and canoes and made good use of them most evening. We are already discussing our next visit and look forward to staying here again! Fantastic! Had everything we could have wanted or needed. Extremely well kept with beautiful garden. The tiki hut was a great place to spend time relaxing. Really appreciated the fans and stereo. The fishing was very good from the dock and by katak. Everyone had a great tjme! Thanks Jim for letting us stay at your place!! It was absolute paradise! We enjoyed seeing the iguanas and manatees right out the back door as well as adventuring out on the kayaks and canoes. Your dock right out the back door sure made it convenient for some ocean fishing and what a catch. We had grouper, snapper, margate and hogfish all in one outing. Then to be able to clean them with your set up under the tiki while listening to music made cleaning fish seem like fun. After all our playing everyday- we were only to happy to retire to our individual rooms, to comfy beds and TV in each one. THANK YOU-THANK YOU!! We will be returning ASAP. We had 8 adults n 1- 4 yr old. Plenty of room for everyone with all the necessities needed for a Great vacation. No seeims were a challenge but whole island had them. Bug spray and fans a Big help. Would deffinately come back again. Thank You Jim for a home way from home.